This dip is perfect to serve up through Thanksgiving. The dip is actually baked in a pumpkin! Serves as a great centerpiece and appetizer! Preheat oven to 350 degrees. While oven is preheating, cut the top off the pumpkin and hollow out the seeds. Begin filling your pumpkin with the cheese and croutons. 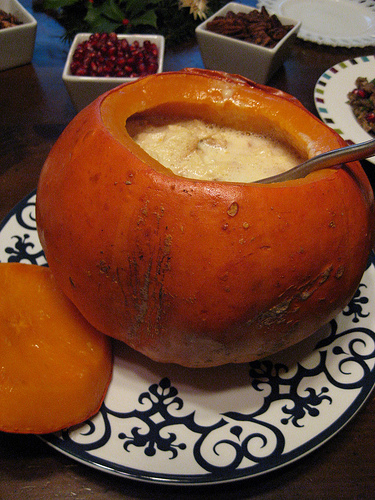 Alternate layers of cheese and croutons until the pumpkin is filled. Pour half & half over the top and sprinkle the top with shallots and place the top of the pumpkin back on. Bake for 1 hour until pumpkin is slightly tender and the inside is hot and bubbly. Serve with breadsticks and vegetables!